The Symphony Orchestra is designed to provide string, wind, brass and percussion students with a thorough background of various styles of music. Acceptance in the Symphony Orchestra is by audition only and consent of the conductor. Auditions are held each spring for the following school year. 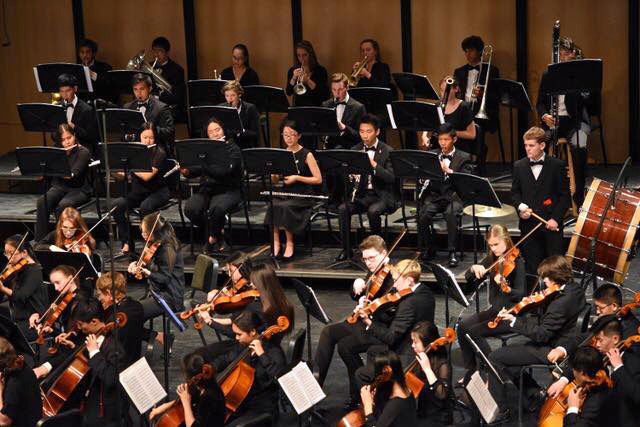 The group studies and performs music for symphony orchestra from the classical to modern eras. In recent years, the Symphony Orchestra has performed Beethoven’s Fifth and Sixth Symphonies, Dvorak’s Eighth and Ninth Symphonies and Elgar’s Nimrod, amongst many other pieces of music from Mozart, Tchaikovsky, Schubert, Schumann, Haydn, Brahms and many other composers. For further information, please contact music instructor Angelo Moreno.